Introduction: The use of epidurals for labor have become more commonly used in the United States, with approximately 61% of women receiving either spinal or epidural analgesia. The most commonly utilized analgesia is the traditional lumbar epidural, which provides excellent segmental analgesia but confines the mother to a bed due to dense motor block. The use of combined spinal-epidural analgesia(CSE), also known as walking epidurals, has become increasingly popular in recent years, because it provides patient with satisfactory pain relief while allowing them to ambulate and feel contractions during labor. Previous literature has shown that the use of CSE analgesia is just as safe as traditional lumbar epidurals, but have been unable to determine whether there are any distinct differences in delivery outcome or labor duration. There are also no studies examining the amount of analgesic medication waste associated with CSE analgesia. 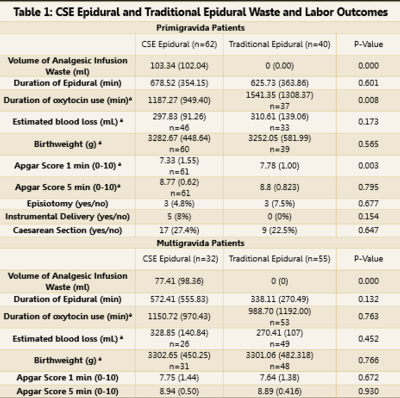 In this study, we conducted a retrospective chart review at Winnie Palmer Hospital of patients who elected to receive either CSE analgesia or traditional epidural analgesia in order to compare volume of medical waste generated, labor duration, and labor outcomes. Method: This study is a retrospective review of 189 patients admitted between 01/01/2013-01/01/2015 at Winnie Palmer Hospital in Orlando who performed a single spontaneously delivered vaginal birth. Patients from two populations stratified into primigravida or multigravida were examined: Patients who elected to receive CSE analgesia, and those who received a traditional epidural. Statistical analysis used to compare the two procedures were two sided t-tests and Fisher’s Exact Test, and used a statistical significant value of <0.05. Statistical calculations were completed utilizing IBM SBSS Statistics 23. Result: In our study, 90.43% of patients with CSE epidurals converted to a traditional epidural after an average of 292.59 minutes. Our results showed that the amount of analgesic medication waste were statistically greater in both primigravida (103.34 mL of medication waste) and multigravida (77.41 mL of medication waste) patients who received CSE analgesia when compared to traditional epidurals. Labor outcomes in primigravida patients with CSE analgesia were also associated with lower APGAR scores at 1 minute(P=0.003) but a higher duration of oxytocin use (p=0.008) compared to traditional epidurals, while no other significant differences were seen in any other labor outcome (duration of epidural, mother’s estimated blood loss, birthweight, 5 minute APGAR score, or the frequency of the use of oxytocin augmentation/episiotomy/instrumental delivery/cesarean section). Similarly, no differences were observed between the two types of analgesia in any of the labor outcomes for multigravida patients. Conclusion: In the absence of any differences between CSE analgesia and traditional epidurals outcomes, these results suggest that traditional epidurals may be the anesthesia of choice for women in labor, because CSE analgesia are associated with higher costs and waste of analgesic medication. Traditional epidural use may allow for more efficient use of resources, which will not only benefit health care administrators, but will also allow for hospitals to allocate these saved costs to provide higher quality of care for mothers in labor and other hospital patients.